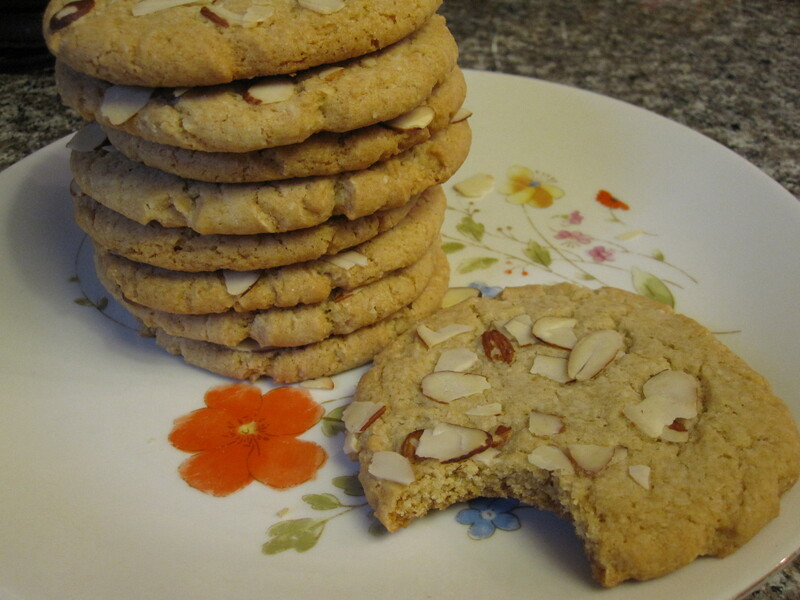 vegan almond cookies – these are so good. Sometimes a cookie walks right into your heart and stays there. A friend baked these cookies over a year ago and brought them to a meeting for Akili Dada, the nonprofit organization I’ve volunteered my time to over the past three years (and whose cause of empowering young women is very near to my heart). After just one bite I was sold. This was the best cookie I had eaten in a very long time – and a vegan cookie at that. After issuing copious compliments to the chef, I, along with everyone else, made her swear to pass along the recipe. 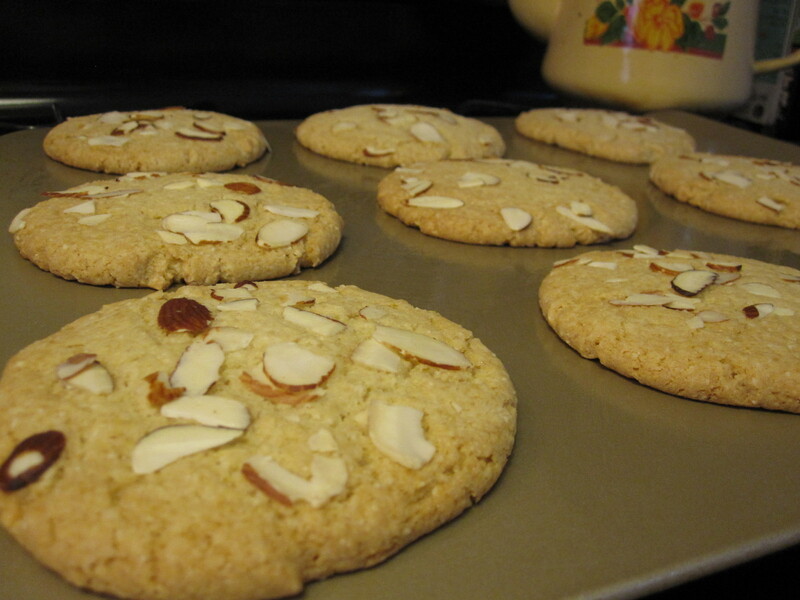 I vowed to myself that I would one day recreate these almond gems. It took nearly a year of friendly pestering to get my friend to finally send along the recipe, and then another few months before I got myself together enough to buy the ingredients and make time to try it out. My first two attempts in mid-December were a bit of a bust. The cookies came out too thin and didn’t hold together very well, although they tasted great. I’m not sure where I went wrong. I may have mis-measured, or maybe my kitchen was too warm that day (I’d been baking all afternoon) and the ingredients didn’t properly coalesce. In any case, they weren’t the cookie I’d eaten at the Akili Dada meeting over a year earlier and had dreamed about ever since. So on New Year’s Day, a day when the world makes resolutions that are kept at a rate of maybe 17%, I resolved to bake a batch of these cookies for the third time. This time around, I took my time and measured carefully. I was determined to succeed. Third time must really be a charm because these cookies seriously rock. I’ve decided to take this as a sign of good things to come in the year ahead. Finally, finally, I have been reunited with my long lost almond cookie love. Not too thick, not too thin. Not to soft, not too crispy. Delightfully sweet, with a splash of savory, and the most addicting almond undercurrent running through it all. If you are late jumping on the New Year’s resolution bandwagon (or even if you’re like me and think resolutions are sort of silly), I highly suggest you resolve to bake more. And if you only bake one thing in 2011, bake these cookies. Bake them and share them, far and wide: take them to a party, sneak them into the movie theatre, bring them to the office, impress your vegan friends, and try not to eat them all yourself (easier said than done). It’ll be a happier 2011 if you do! Preheat oven to 350 degrees F. Grease two large cookie sheets (or use one and bake in batches). Sift together the flour, almond meal, baking soda, and salt. Set aside. In a large bowl, beat together the oil, brown rice syrup, rice milk, sugar, extracts, and sesame oil. Add the flour mixture and mix until a firm dough forms. Roll the dough into balls, using about 2 tablespoons of dough apiece. 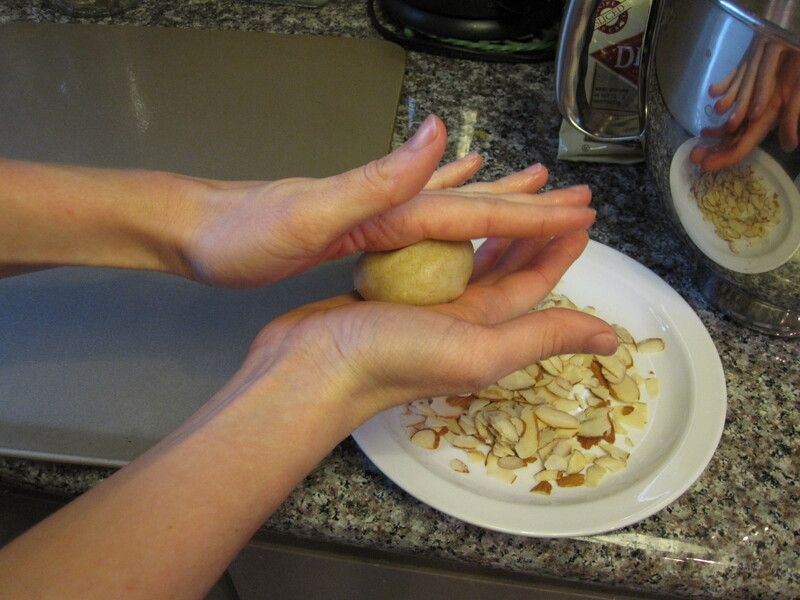 With each ball, press one side into the sliced almonds and place at least 2 inches apart, almond side up, on the cookie sheet. Flatten each dough ball to about an inch thick, using a flat-bottomed 1 cup measuring cup. Bake for 12 to 15 minutes, until edges are slightly golden brown (I baked for closer to 12 than 15 minutes). Allow cookies to cool for 5-10 minutes before removing from them sheet. 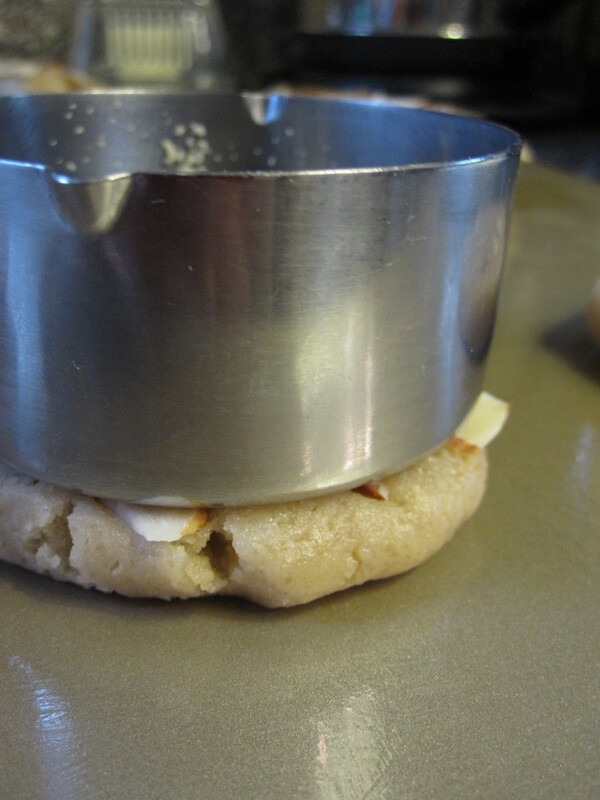 The cookies will be very soft and will continue to firm as they cool. Place on cooling rack to cool completely. 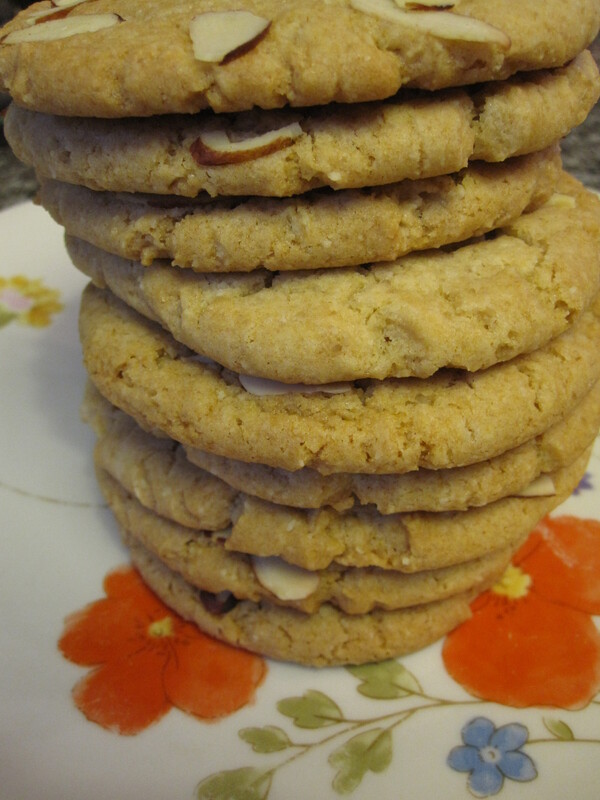 This entry was posted in Not pie, Vegan and tagged almond cookies, vegan. Bookmark the permalink. 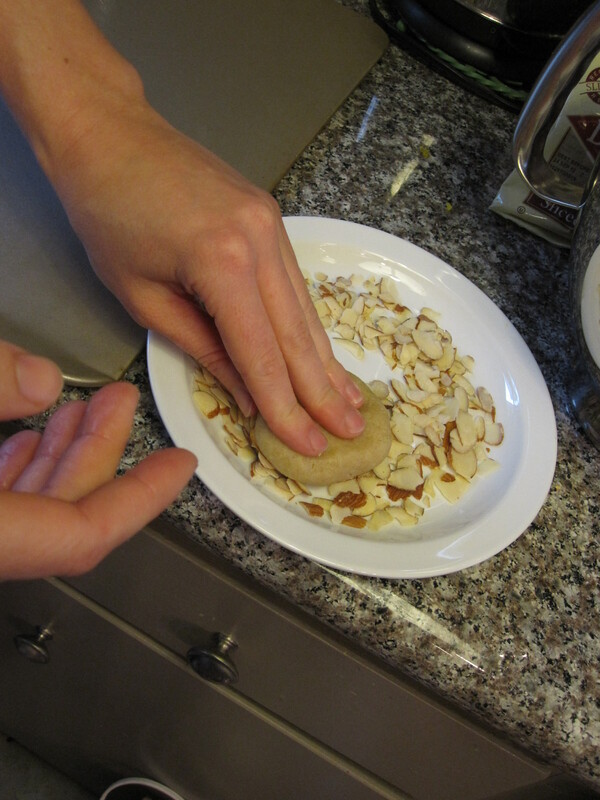 3 Responses to vegan almond cookies – these are so good. I just finished these and they’re delicious! They’re honestly the best vegan cookies I’ve ever tasted.